I promised last week I'd get my hands on one of these and let you know what I thought. Just to clarify I haven't bought one, I just got have a lil play. Two years ago, this would have been a world beater. Now though it will live in the shadow of the i-Pod Touch. Sony, for the most part make lovely bits of kit, that despite the pricepoint make you drool. To be honest this isn't one of them. It has a weird feel to it. It should be shiny but they've gone for sort of graphite type, roughish finish that feels a little odd in ones hands. The touch screen is ok, and video's in particular look great on it, but it is smaller than a Touch's and the cover flow option looks like a poor impression of Apple's. 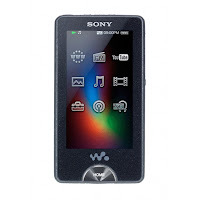 It has Wifi but it feels fiddly compared to the i-Pods and the real error, that Sony continue to make is, no Apps. At least not at the moment and that is such a big miss. There are some neat innovations. Having buttons on the top of the unit is a great way to control it without removing it from your pocket. Clever. There's also a nice chunky hold button... The sound quality is also fantastic with noise cancelling built in. It's not a bad try to be honest. And if Apple didn't exist we'd all want one. But they do, so we don't. Sorry Sony.